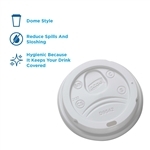 We've got a selection of wholesale dome lids to fit a variety of cups from top manufacturers like Dixie, Georgia Pacific, EMI Yoshi, Solo Cup and Dart Container. These are names you trust for providing quality cups and lids, and you can buy dome cup lids in bulk at great wholesale prices. Choose from high-dome lids or standard, clear dome lids, black or white, lids made from paper or lids made from PET plastic. You'll find insulated sip-thru lids and lids with identification buttons. Clear and ultra-clear dome lids with various sized holes allow for use with a range of products like yogurt and ice cream. Regular dome lids are perfect for beverages that require extra room for additions like whipped cream or other toppings. 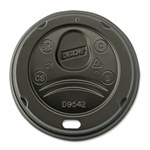 Buy disposable Dome Cup Lids for your cups today.